Amongst my wonderful Christmas gifts was a bibimbap kit from Sous Chef. 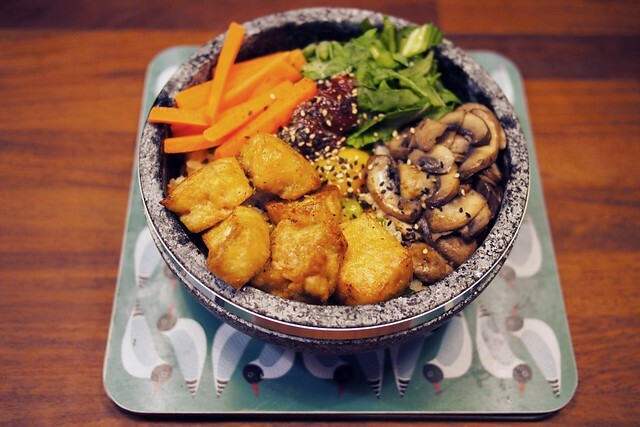 It’s a Korean dish literally meaning ‘mixed rice’ – a bowl of rice cooked in a stone pot topped with various vegetables and meat or tofu, finished with an egg and seasoned with hot pepper paste. I’ve been wanting to try it again since we had a similar thing in Tokyo. 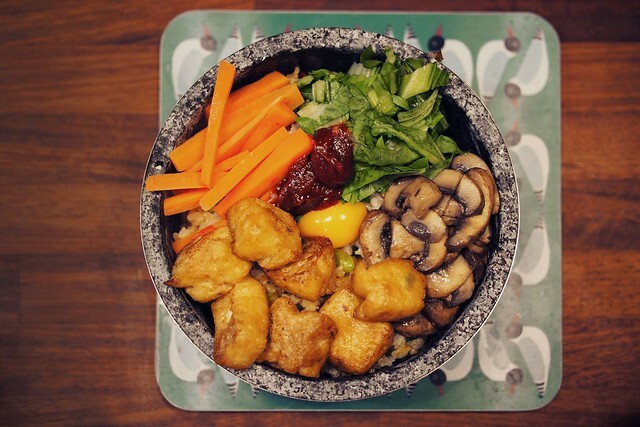 There are also a couple of Korean restaurants serving it in London now, like the aptly-named Bibimbap in Soho. It turns out that bibimbap, despite looking quite impressive, is really fun to cook and barely even needs a recipe, although I’ve attached my notes below. 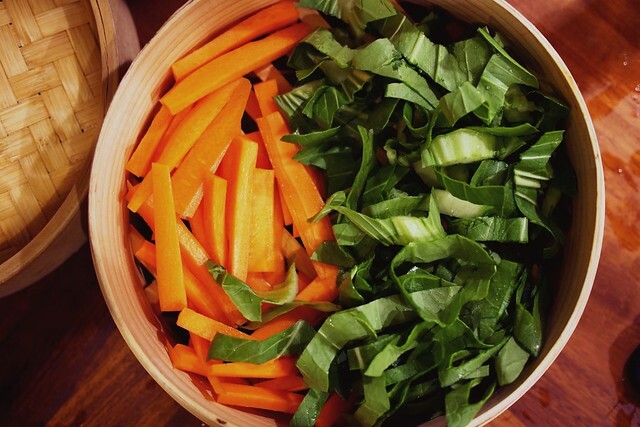 The cooking process is really just a prep and assembly job: cooking the rice, heating the dolsot and chopping and cooking the veg (simply steamed or sautéed). If you’re alright with multitasking it can be ready in about half an hour. 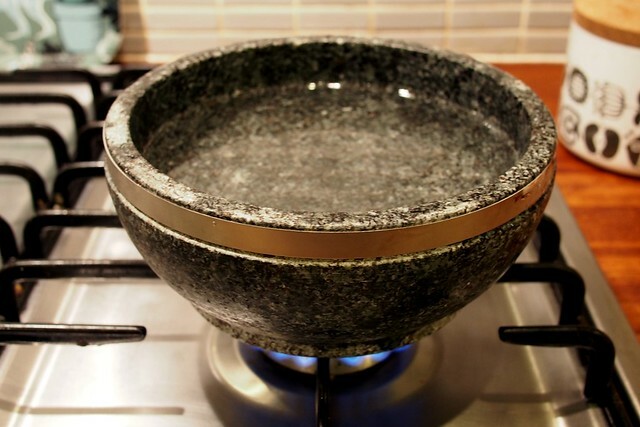 The key to an authentic bibimbap is the special stone cooking pot called a dolsot. 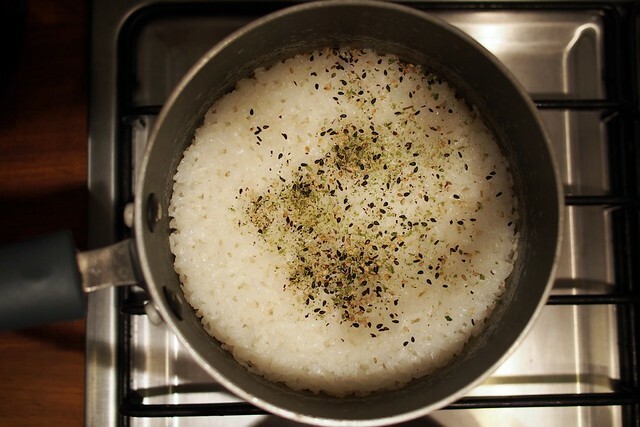 It’s warmed on the hob and seasoned with sesame oil before adding the rice for its final cooking. The roasting-hot stone imparts a mysteriously wonderful quality to the dish, as well as making delicious crackly morsels of rice around the edges to pick off with your chopsticks. It holds the heat extremely well, cooking the egg yolk and keeping the rice warm as you dig in. You can easily adapt the basic recipe to your favourite vegetable/protein combo, and make it vegan by omitting the egg. 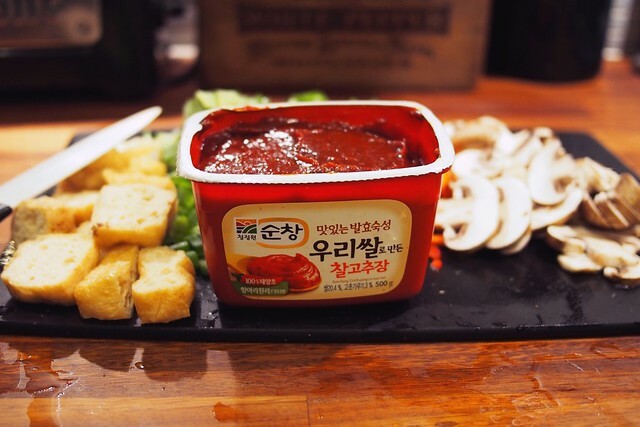 The one absolutely essential ingredient is the gochujang, a salty, spicy red pepper paste that provides all the seasoning the dish needs. 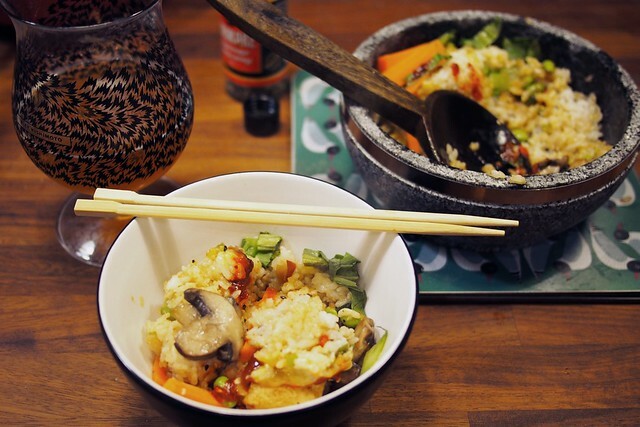 It comes in a pleasingly Asian-looking little tub and will last in the fridge for ages – if you don’t make bibimbap every night anyway, as I’m now tempted to do. For such low effort, the taste is just amazing, and it’s a pretty healthy yet hearty and filling dish. It’s definitely being added to my regular roster. 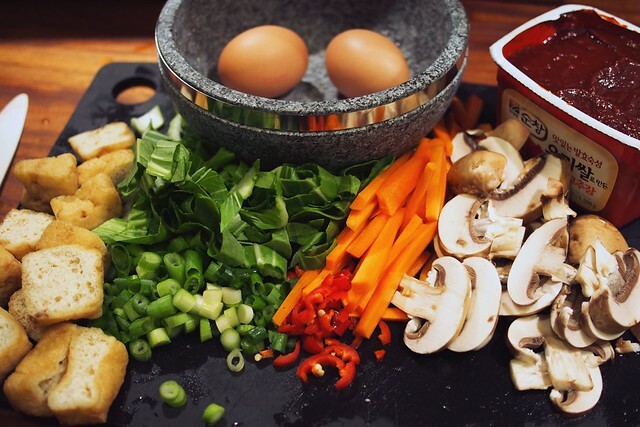 You can buy a bibimbap kit with everything you need to get started from Sous Chef. Let me know if you have a go! This looks amazing! I’m loving everything from Sous Chef. That looks delicious! I may have to get a dolsot! Wow, wrong time to look at this – so hungry now! WOW! That looks so good. Very healthy too. I have to try this recipe some time soon, it looks so delicious and healthy! Thank you for sharing the idea with us, your pictures are just so mouth-watering!